Gabriella Stumpf and Finally Love. Photos copyright SusanJStickle.com. 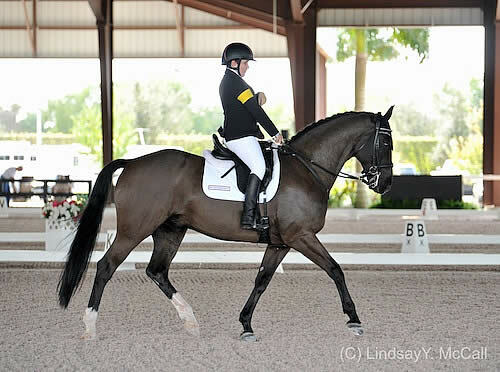 Wellington, FL — January 11, 2015 — Gabriela Stumpf (AUT) and Finally Love performed a lovely test to take the win with a score of 69.927% in the Adequan® Global Dressage Festival (AGDF) FEI Intermediaire 1 Freestyle presented by MTICA Farm. Mary Bahniuk-Lauritsen (USA) and Wench De Jeu followed in second scoring a 68.675% and Jill Irving and Dio Mio finished in third with a total score of 68.625%. Finally Love will compete again in two weeks at the Intermediaire II level with Stumpf, and the pair will look to improve upon the scores they received in the first week of competition. “We started him at the lower levels, and we have slowly moved our way up. He is very easy and fun and has a super personality,” she smiled. A native of Harvard, Massachusetts, Bahniuk-Lauritsen is looking forward to taking advantage of her time in South Florida. “We have our eyes on the Pan American Games and there is also the Nations Cup. A few pairs will be given grants to travel to Europe this summer so we’re hoping to be considered for all of those opportunities based on our performances here at AGDF,” she stated. Today also concluded the first week of the competition for Para-Equestrian Dressage, as riders are looking to qualify for the coming 2016 Paralympic Games in Rio de Janeiro, Brazil. The week was highlighted by some truly spectacular riding in the Van Kampen arena with some of the best Paralympic riders in North America competing. Sydney Collier (USA), winner of the 2014 Junior Equestrian of the Year Award presented by the United States Equestrian Federation, was competing two horses, including a new mount she hopes to qualify for Rio with, NTEC Roulette. Riders from Canada and the United States were represented during competition this week.